I never tire of listening to tales about my husband’s formative years. Growing up on 3 acres, his family raised much of their own food. At the age of 12, Jack planted a corn field which started his first entrepreneurial endeavor by selling his product to local vendors. He built barns with his dentist Dad, canned peaches from their orchard with his Mom and raised rabbits. Me, on the other hand, grew up as an east coast city girl, eating canned goods. The freshest food at our table was iceberg lettuce! Jack grew up “playing in the dirt” and because of that, organic gardening comes very naturally to him. In this post he is offering some practical tips as my guest blogger. Enjoy! All gardens need a few essentials to produce bumper crops. Successful Organic Gardening Basics techniques are really quite simple. Most of the hard work is early on in the preparation and planting stage. If you pay close attention to a few important ideas you will amazed at how much enjoyment gardening brings and how much your garden will produce. 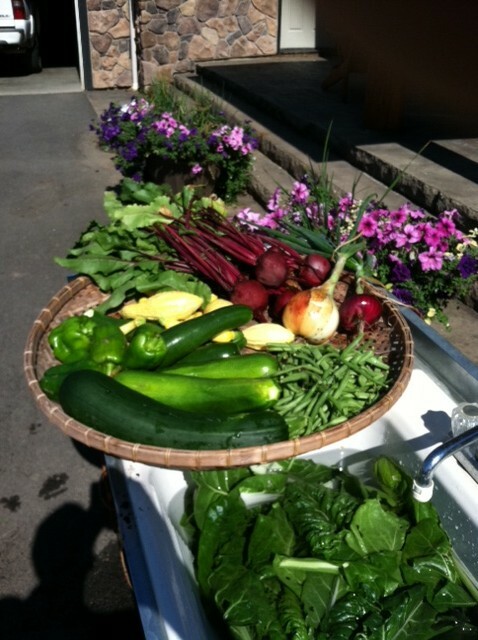 Even the smallest city plots can feed a family all summer. 1. Soil preparation done right will pay great dividends. Here is where initial tilling and composting with well decayed composted material and or manure is indispensable. Well-rotted or aged manure is best and will release nitrogen into your garden soil. This is important because fresh compost or straw takes nitrogen out of the soil in order for the bacteria to break down the material. When it is thoroughly composted it releases that nitrogen back into the soil.Tip: Never use lawn clippings that have been treated with any type of weed & feed products.Tip: Coffee grounds are a great addition to soil and foster earth worm habitat. 2. Choose crops that have a history of growing well in the area where you live. You can generally find this information on most seed packets. Pay particular attention to the length of your growing season. In our area we have a great 90 day season so crops like watermelon are very marginal since they tend to need 110 days or more. Furthermore, plant the right crops at the right time of the growing season. 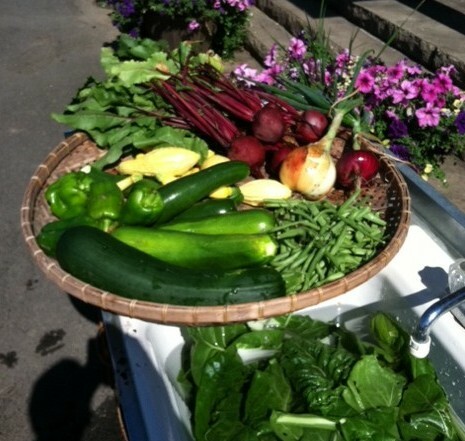 The following vegetables do well in Spokane, WA where we live. Tip: Be careful to not plant seeds to deep…1/4” to ½” deep for most seeds, lightly pack down soil. Tip: Soak your corn in water for two days before planting and if you want to kick-start these seeds mix in a small amount of manure (like a light broth). Tip: Be careful to not plant tall crops next to small varieties that shade or block your watering system. 3. Good Producers We like to grow vegetables that produce early and throughout the summer and fall. These are all greens like leaf lettuce, Zucchini, Crook neck squash, Chard, string beans and Kale. What we don’t give to friends we put in the freezer. In fact we eat from our garden year around. 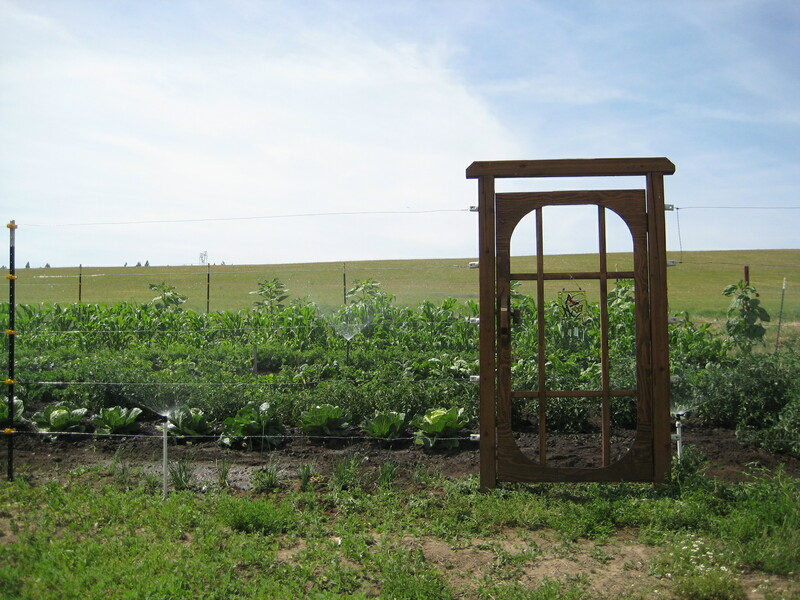 Tomatoes, pole beans, squash/pumpkins do well alongside a fence or deck rail where you can string the vines up and thereby minimizing the ground space required. Even a patio pot can grow great tomatoes and all types of vegetables. You will however, need a pot big and deep enough to hold enough soil and moisture to provide consistent growth (minimum size should be 16’ wide x 16 deep with good drainage). Regular irrigation is very important. Simple drip systems can be set up for less than $25.00. Note: Double your crop simply by doubling your rows of the same type or similar size plant. I plant rows about 24” apart to allow space to till, then another vegetable row (of compatible size) just 6” away and then 24” again and repeat. Tip: To get great tomatoes remember to pinch out the suckers between the stems, otherwise you will produce a lot of stems and leafs and smaller and late ripening fruit. 4. Natural insect control is not fool-proof. Healthy soil is the best form of insect control. Good natural fertilizer (manure) worked into the soil early in the season is important. The best types of manure in order of quality are: rabbit, lama, cow, horse. Chicken manure should only be used in small amounts because it can burn the plants. 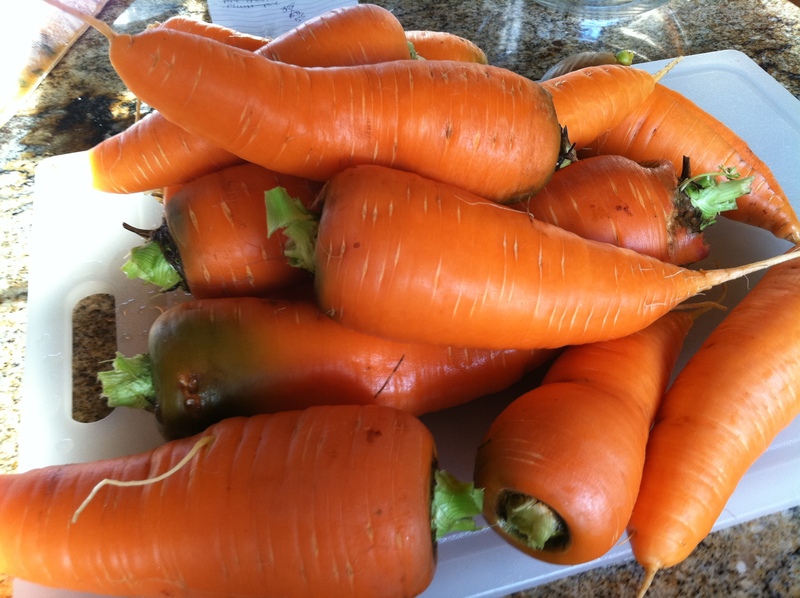 It is so nitrogen rich that you will grow magnificent carrot and potato tops but have very small, anemic edible portions. Because of the diet and more efficient digestive process rabbit and lama provide very clean and balanced soil nutrition. Cow and horse manure is somewhat less desirable because of the enormous amount of weed and other seeds that will come with it but is most readily available. Tip: Companion crops that repel many insects are garlic, onions and Marigold flowers. Tip: Earthworms, lady bugs, lacewings and praying mantis are your friends. Earthworms thrive in well composted soil. 5. Deer and rodents can be a big problem for more rural gardeners. We have a lot of deer but have not had a problem with them. We put up a 5 strand electric fence less than 6’ high, powered by solar unit (paid $116.00 at Lowes). We then took a few strips of tinfoil smeared with peanut butter and attached them to the wires between posts. Deer are creatures of habit so when they are drawn to the strips and get a real good whack on their nose or tongue they don’t try to enter the garden anymore. Moles, mice and Voles are another country problem. We noticed that they didn’t like onions or garlic but loved carrots, beets and potatoes so we planted about 8-10’ row of carrots then 8-10’ of onions, alternating throughout the garden, especially on the perimeter. We went from losing about 25% of our root vegetables to not giving up a single carrot, etc. to those critters last year. I think you will get good results with less onions, etc. Just mix them up. Note: We made the fence so that we can open both ends wide open to facilitate spring and fall tilling. 6. Weed control made easy The key here is to never let the weeds get going. If they are allowed to go to seed you will be fighting an uphill battle that would discourage anybody. Here’s the drill: till the ground as early in the Spring as possible, wait two-three weeks and till again shortly before you plant your early crops, say in mid to late April. Don’t worry about being “late” planting, even mid to late May will be just fine. In fact, your garden will likely catch up and surpass the early birds because our cold, rainy April nights will often cause many of the seeds to rot or stunt. Note: Till early and often for the first month, weed and thin your rows while weeds are small and the vegetables have enough roots to not be disturbed. Once the plants are 6-8 inches high in late May or early June you will be pulling the occasional weed here and there as you walk through the rows. By July you won’t be weeding at all. Tip: Don’t over water. Timed and target drip or soaker irrigation will greatly reduce weeds. 7. Organic seeds–hybrid- Heirloom Organic seeds have been raised in naturally prepared soil free of any chemical herbicides or insecticides. Hybrids are selectively bred seeds for perhaps better yield, color or size. However, their seeds cannot reproduce…they are a one-shot crop and because they have in instances been genetically engineered (GMO genetically modified organisms) they may carry some long-term health hazards. Heirloom seeds are as close to the original form possible and often will vary in size and color. Some heirloom tomatoes we have raised are deep red and dark green in places and by far some of the sweetest, juiciest tomatoes we have ever eaten. Please see The Shopping Guide under my Resources tab, posted July 10, 2011 for seed and gardening supplies. If you have any questions please feel free to ask in the comment section of the blog and we will do our best to promptly answer. Next up: small space gardening! On another note; I still have openings for the Whole Wheat Bread Baking and Chapathi Flatbread class on April 21st, 11 am to 1 pm. Please e-mail me @ cookwithamyg@gmail.com if you’re interested. Good to know it’s helpful. Thanks DK! so many great tips…thank you for sharing..I would really love to have a garden!!! Do you have space for a garden Denise? Thanks for stopping by and commenting. i was just about to call you for advice! Dane & I spent the day weeding and prepping for the spring/summer. I feel like such a gardening newbie! great helpful post. can I get a personal appointment with you when you’re here 😉 Love you Dad! Its like you read my mind! You appear to understand a lot about this. I feel like this is wonderful blog. A fantastic read. I will definitely be back. Good tips here, I hope these lower the learning curve for those that are starting! Gardening is a really great thing, it just takes some work and a lot of patience.